2. 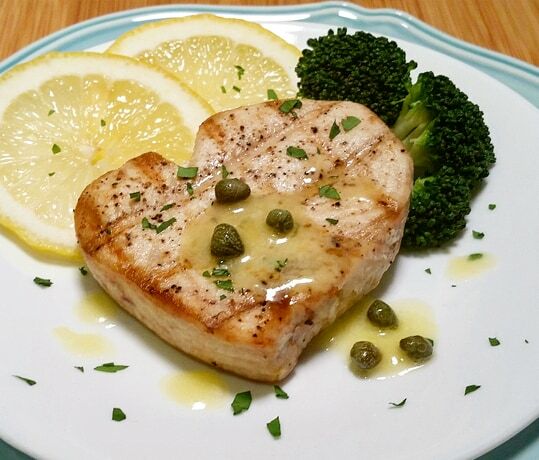 Coat Haskell’s Swordfish medallions with olive oil and season with salt and pepper on both sides of the medallions. 3. Grill Swordfish Medallions for about 2 minutes on each side. Transfer the Swordfish to plates and allow it to rest. 4. Place the butter into a small sauté pan and set over medium heat. 5. Once the butter has fully melted and begins to foam, add the garlic and capers and cook for about one minute until fragrant. 6. Deglaze the pan by adding the white wine and lemon juice and allow mixture to cook and reduce for 3 minutes. 7. Drop the heat to medium low, add the parsley, and stir for 1 minute. 8. Remove sauté pan from heat, pour sauce directly over the grilled Swordfish and serve with accompaniments such as broccoli, asparagus, or rice.